Thinking of getting your own video? Check out our social media video page for more information and video examples. When we think about social media marketing, we tend to put our blinkers on and assume that you need to create the best content in the world to see some form of victory. If your video didn’t go viral, it was a failure, right? Video content is increasingly popular and doesn’t have to go viral to drive results. More video content is uploaded in 30 days than major U.S television networks have created in 30 years… It’d be crazy if every piece of filmed footage reached every corner of the internet, right? There’s clearly a demand for video content, which means you need to be using it in your marketing strategy. One place that video is gaining popularity is the social platform, LinkedIn. Being a B2B platform for professionals to connect, posting videos on here can boost your professional and personal brand – especially when you get it right. LinkedIn video is already popular as it offers many benefits to the creators who publish them. 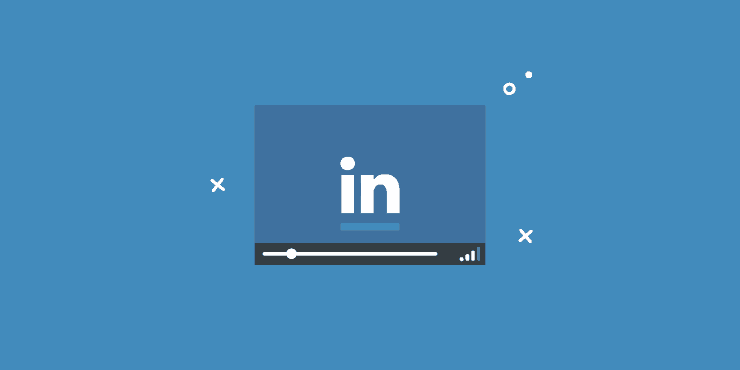 It’s been found that 51% of video marketers have used LinkedIn video as a channel. And, of those people, 84% found it to be an effective strategy. As a result, the use of LinkedIn video is on the rise. Almost 2 out of 3 (61%) marketers plan to use video content on the social platform in 2019, up from 55% the previous year. In this article, we’ll share the uses of LinkedIn video, along with several tips to boost the success of your content. What Can I Use LinkedIn Video For? People, in general, are inquisitive. They’re always curious to learn more about who they’re connecting with. On a platform like LinkedIn, which is built for establishing relationships, you can use video to pique the interest of your connections. You can do this by sharing a video, and posting it in your Feed. It could be the story behind your business venture, or a quick explanation behind how you got started. Just like a traditional status update, add a bit of text to draw people in, and embed your video directly below. Video is considered highly in LinkedIn’s algorithm. Because of this, you’re in with a better chance of your video reaching the top of a person’s Feed. Plus, sharing your story allows people to really understand you and your brand; boosting brand awareness and furthering relationships with your connections. Just like any other marketing activity, the main focus of your LinkedIn video strategy is likely to be an improvement on your bottom line. Let’s face it – we can’t spend time (or money) completing activities without a high return on investment (ROI). For that reason, you could use LinkedIn video to promote your products. Post how-to’s or demonstrations of your products; answer frequently-asked questions; or share upcoming launch details. Whatever’s in the pipeline for your product or service offering, allow people to watch a video and really get excited about it! As much as LinkedIn is great for promoting your business, it’s also used by individuals who want to improve their personal brand. People want to be known as an influencer in their niche so when their audience are looking to hire someone that could assist them with a problem, they’re the first port of call. You can fulfil the desire of building your personal brand by treating LinkedIn as a vlogging platform. What annoys you? What fires you up? Is there an interesting story behind why you built your business? Whatever story you have to tell, share it with your connections. Being relatable will see your connection count surge, as well as your engagement rate! Unfortunately, the spray and pray method doesn’t work on social media. Publishing video content without a detailed plan behind it only leads to misery. You haven’t taken the time to make your video impressive for your audience. Why should they bother to watch it? Think about how often you use your mobile phone to surf the internet. The chances are, it’s an activity that you complete daily. Your audience are the same! In fact, 57% of all engagement on LinkedIn is via mobile. Long gone are the days of desktop browsing reigning supreme; we now need to ensure that our video marketing efforts pay-off by optimising content for mobile users. You can do this by using the correct format – preferably a high-quality video that can be orientated to fit a small screen. The aspect ratio of your content can be 1:2.4 to 2.4:1, and the maximum file size for LinkedIn video content is 5GB… Although a file of this size may cause fast loading times, and frustrate people browsing on mobile. Don’t forget to add subtitles for users who mute videos when watching in public, and preview your content on mobile before hitting the publish button. Did you know that the attention span of a human is becoming increasingly similar to a goldfish’s? We’re too busy to invest time in video when browsing social media, and the stats prove it: In 2017, the average length for a video was 3 minutes and 48 seconds… But only 10 seconds of that content was actually watched. You can prevent people from bouncing off your LinkedIn video content by keeping it short, and to the point. Avoid babbling and discuss the topic instantly – preferably within the first six seconds to grab a browser’s attention. When writing your video script, ensure that your first few sentences are strong, solid and to-the-point. Once you’ve hooked them in, feel free to expand on your point. But remember, LinkedIn videos have a limit of 10 minutes in the Feed! Your goal with video marketing is to get as many eyes on your content, as possible. The “build it and they will come” method doesn’t always work, so you’ll need to promote your latest video release elsewhere on the platform. You can increase the number of eyes on your LinkedIn video by linking to it elsewhere on the platform. Treat the video as island content: whenever you post something relevant to it, link back to the video. Write a post (or even better, a transcript) of your video and publish it as an article using the Publisher tool. Embed the video content in your post, and drive traffic back to it using other social media platforms. Yes, content is king… but promotion is queen! Remember how we mentioned that LinkedIn is a platform built for professionals? Posting low-quality videos with bad editing won’t cater to that vibe! In order to make your brand seem more professional on such a crucial social platform, consider hiring a video marketing expert to create your video content. Outsourcing your video production gives your marketing project a solid basis. Experts will be able to build a lighting set-up that shows your business in the best light. And, with existing knowledge and specialties within the industry, they’ll know the sure-fire ways to get your message across – in the right way. As you can see, there are promising benefits to using LinkedIn video marketing, and your business could be next to triumph. To discover more video marketing predictions for 2019, head over to our survey results. We questioned hundreds of marketers to find the strategies set to soar in usage this year. By discovering them today, you could be the first to reap the rewards earlier than your competition! Thinking of getting your own video? Check out our social media videos page for more information and video examples.